It's that time of the month again. 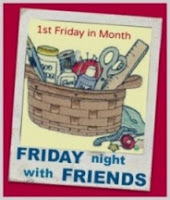 I will be joining in with Friday Night with Friends, so why not pop over to Cheryls blog and join us. Today I will be spending Friday Night with Andrea (the first tropical storm of the season!) We will have lots of rains and chance of tornados--it could be a wild afternoon and evening.